In what could only called an end-run around the First Amendment, the Washington Transit Authority banned “political ads” after AFDI submitted our free speech campaign. As one of my readers pointed out, no contemporary medium of communication may pass the test of being merely commercial and non-political. The New York Times runs an editorial page every day — not to mention the slant of their “straight news” — and therefore, if they can advertise, so can the Village Voice, the Socialist Militant, and Dabiq (ISIS’ four-color magazine), for that matter. Public safety has been thrown in for good measure, as if these craven quislings know what is conducive to the public good. Color me skeptical. As for buses being a target for jihadis — if we’ve learned anything since 9/11, it is that America is the target. The West is the target for Islamic terrorism. The whole country is on heightened alert for an Islamic State attack on July 4th. Abridging our freedoms so as not to offend savages is surrender and un-American. It results in more demands, more surrender, more capitulation to sharia law (which is what WMATA did). Running and hiding is no strategy in a war. Operation Fetal Position is a recipe for disaster. WMATA is adhering to Islamic law, contravening our First Amendment rights. Were the Jewish children in a Toulouse Jewish Day school responsible for their slaughter? The shoppers at the Hyper Cacher? The soldiers at Fort Hood? The runners at the Boston Marathon? 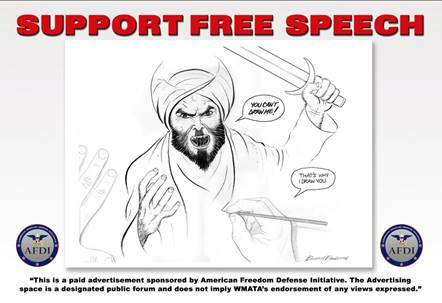 Today, the American Freedom Law Center (AFLC) filed a federal civil rights lawsuit against the Washington Metropolitan Area Transit Authority (WMATA) for refusing to run a “Support Free Speech” advertisement that depicted the winning entry of the “Draw Mohammad Contest” recently held in Garland, Texas. The lawsuit was filed in the United States District Court for the District of Columbia on behalf of the advertisement’s sponsors, the American Freedom Defense Initiative (AFDI) and its co-founders, Pamela Geller and Robert Spencer. Geller’s advertisement makes the point that the First Amendment will not yield to Sharia-adherent Islamists who want to enforce so-called blasphemy laws here in the United States, whether through threats of violence or through the actions of complicit government officials.